The Austrian painter Ferdinand Georg Waldmüller is considered the very epitome of an artist from the Biedermeier era. 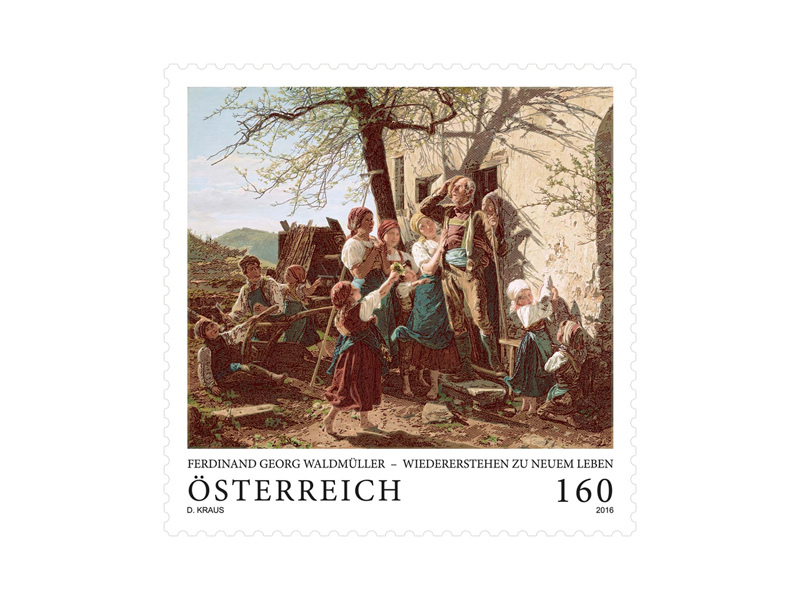 Austrian Post is celebrating the prominent painter with a commemorative stamp in the “Old Masters” series. 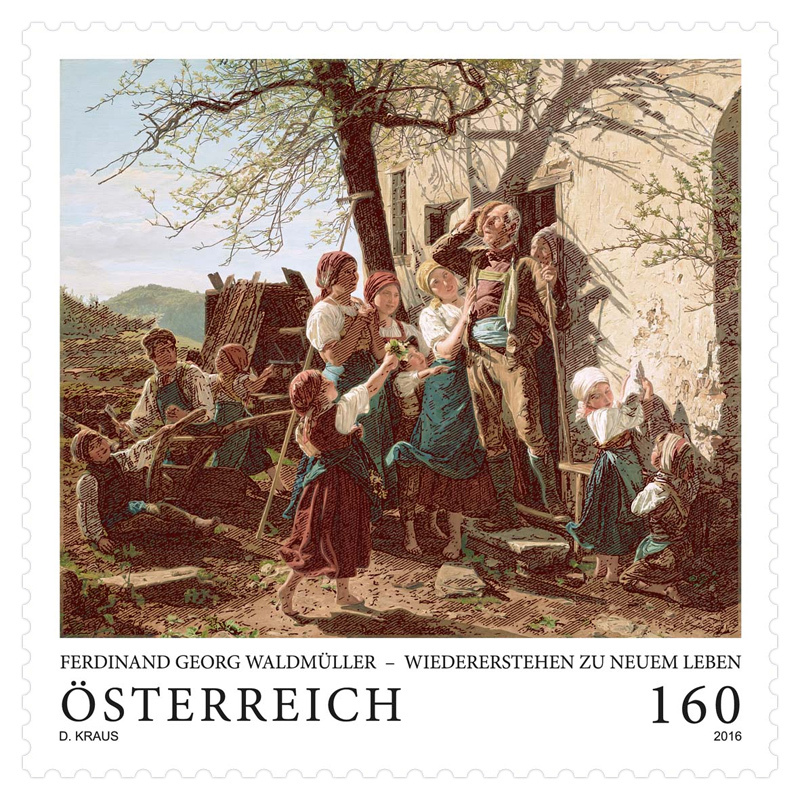 Waldmüller was born in 1793 in Vienna. At the tender age of just 14 he attended the Academy of Fine Arts in Vienna and earned his living as a portrait artist, drawing teacher and theatrical set designer. Over time he also began to paint landscapes and the genre paintings of everyday scenes for which he later became famous. He frequently travelled to Italy and to the Salzkammergut, where many of his most famous works were created. In 1829 he was appointed as curator of the painting collection and as a teacher by the Academy of Fine Arts, but his relationship with his employer soon turned sour: Waldmüller’s ideas for educational reform and on the academic collection were repeatedly rejected. He was forbidden to give any further private lessons in his rooms at the Academy and his studio there was taken away from him. Following publication of yet another polemic paper, in 1857 he was forced to retire and found himself in ever worsening financial straits. Waldmüller died in 1865 in Hinterbrühl near Mödling. His objective, naturalistic depictions were not always well received by his contemporaries. Still lifes, portraits, landscapes and, in particular, rural scenes filled with realism and attention to detail constitute the main body of his work, although social issues such as poverty or homelessness often lurk behind the apparently idyllic scenes. Light and its effect play a central role in his paintings and give them a radiant appeal. It was primarily abroad that Waldmüller found recognition as an artist, and he was able to sell some paintings at the Universal Exhibition in Paris and during a visit to Buckingham Palace. It was only long after his death that his works were rediscovered and their artistic importance recognised. “Revival to New Life” was painted in 1852. Here, too, it is light and shadow that gives life to the painting: the gleaming sunlight makes the picture glow. Spring has arrived and everything is awakening to new life. This is reflected not only in the smiling faces of the people, but also in the blossoming nature that surrounds them: in the branches of the tree as they turn green or in the little bunch of flowers in the girl’s hand. Despite their evident poverty, the people are clearly rejoicing in the old tree’s recovery and this radiant spring day. Waldmüller characterises each individual in the picture with prodigious attention to detail: the clothing, the tree, the building – each one is meticulously depicted. The oil painting belongs to the Princely Collections of Liechtenstein (LIECHTENSTEIN. The Princely Collections, Vaduz – Vienna).